Great for certain training, such as BARKING! I call this, miracle air in a can. If you have a barker or other unwanted behaviors, this stuff is very effective for training. It makes a harsh, "SHHH!" sound that gets their attention. So, if you follow the training instructions, you will love it! Basically you give a command such as, ENOUGH during a barking fit and immediately press the plunger for the "SHHH!" sound and they stop barking right away and then praise them. You do not spray it at them, it is designed for the sound. 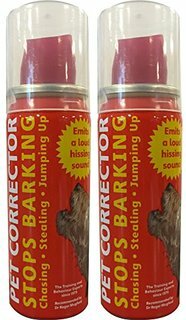 This gets their attention and is great for multiple dogs barking at once. The goal is to use it less and less as you train the behavior out of them and then only need it occasionally as a reminder.